Many of us have spent time focussing on blogs, Facebook and Twitter as a means of connecting with others and promoting our work, although recent years have seen an explosion in social media possibilities. We can now promote work through Pinterest, Instagram, Google +, and countless others besides. Despite its initial popularity, I think Google+ hasn't caught on quite the way it should have done because people aren't entirely sure how to use it. This post is intended as a quick introduction to its main features, and how you can use them to promote your work, and connect with others. Circles are a brilliant addition to social media, allowing you to filter your news feed according to specific groups of friends, and you can post to certain circles to make sure that you have a modicum of control over who sees what. For example, you might have circles for fellow crafters/writers, colleagues, family and other friends. Your colleagues might not be interested in whatever you've been making or writing lately, in the same way your family might not be interested in work-related posts. When adding friends, simply add them to the right circle (people can be in more than one circle) and choose that circle when posting. If you're not bothered who sees what, you can just select 'Public' or 'Your Circles' - the former makes the content public, the latter means only those people you've added to any circles can see it. Imagine a version of Skype that actually works, and lets you connect via video chat to several people at once, and that's what the hangouts function is all about. Hangouts aren't 'closed' so anyone involved can invite someone else, so you can end up chatting to people you didn't know beforehand. When you create a post, you get the opportunity to add a lovely focal image at the top of the post, which is a wonderful way to showcase photos of your work, or photos related to the content of your post. It's much more visual than Facebook, with its piddly thumbnails. I post photos of the things I've made into a specific album, and look how big and lovely the images are when they show up in my newsfeed. As for photos, if you've got an Android phone, you can opt to have photos instantly upload to Google +, and it's then up to you to choose which to actually post publicly. It's a nice feature if you're worried you might lose your phone - and therefore your photos. If you host your blog on Blogger, you can also integrate your account with Google + for cross-posting. There is also an option to email the members of your circle to let them know you've posted something on Google +. Personally, I find this massively intrusive - I'll check Google + when it suits me, in the same way I keep track of blogs in Feedly so I don't need an email to tell me when a new post has gone up. Use this feature with caution because you don't want to be accused of spam, particularly if the post you're emailing about is a sales pitch. There's a social media rule of 80/20 - 80% of posts should be about things besides yourself, and 20% are you and your product. Give people a reason to engage with you. I post a lot of links to web posts I find interesting, with a personal recommendation as to why I find them interesting. 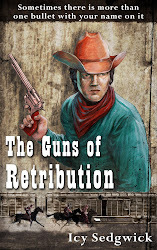 I only post links to my own writing once a week for my free flash stories on my blog, and even then, I'm not selling. The profiles on Google + are rather extensive - I've taken advantage of the 'skills' feature in the 'Work' box to add all the things I do in my spare time as I see them as skills, not just hobbies. 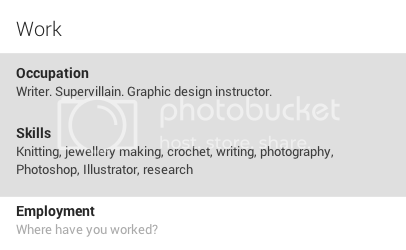 I could fill in the employment box but I can't see the point at the moment as I'm using Google + for my writing and handmade crafts work, not my actual day job, but if I wanted to connect with my colleagues, then it would be easy enough to add my current and former jobs. Make sure you upload a good profile photo as this will appear in Google search results if people search for things you've posted about. The benefit? People are more likely to click on a link if it looks like a real person wrote the post. You also get the option to put a cover image on your profile, and it's a lot bigger than the one Facebook lets you have. Your maximum size is 2120 x 1192 pixels so you've got plenty of pixels to make your image look clear as a bell. Make sure your image scales properly, and bear in mind where your profile photo will appear so you don't cover up a vital part of your cover image. As well as a profile, you can also set up a page as well, particularly if you have a blog you want to promote. You can also add links to your presence elsewhere, such as Pinterest, Twitter, Instagram etc., making it easier for your new Google + contacts to find you elsewhere too. Communities are a lot like Facebook groups or Twitter #hashtag communities, but again, posts have images attached, so it looks a bit nicer than the page full of text that can comprise a Facebook group page. You can find other people with your interests and interact with them. I'm only a member of six communities currently, and I don't interact nearly as much as I should, but it's a good set up and a good idea so I'm going to focus on engaging with other people as much as I can. Add a +1 button to your posts so people can show they approve - it's a little like the 'like' button on Facebook. If you have a powerful presence with a lot of people that you engage with, it'll boost your search rankings on Google. Also, if you link your website to your Google+ profile, your photo will appear whenever people search for topics you've discussed on your blog. It does sound like a lot of work, and building a profile and a friend base can seem like a lot of hard work, but regular engagement on Google + will help your Google ranking for websites and pages. You can categorize your friends, and you won't have to pay to promote your posts. 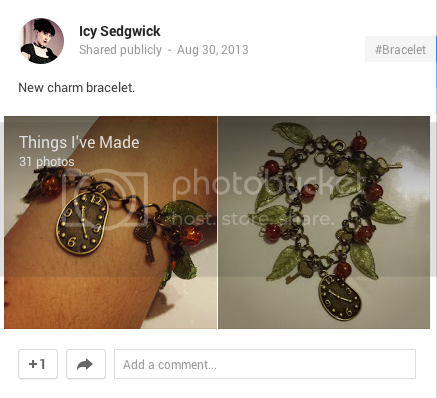 Google + has more of a visual bias than Facebook, meaning all of your lovely images of your crafty work won't go unnoticed! 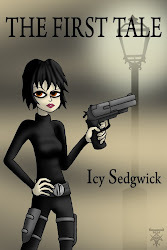 Come and find me on Google + here, or on Pinterest, Instagram and Twitter! Nice overview and great point on the visual advantages. I enjoy Google+, but I don't see much activity from writers outside of you and a few others. Due to the visuals, +1, and categorizing it seems there's a great reach potential. I find more interesting things from the people I follow compared to Twitter even with fewer posts.